Even though we tend to think of Mercedes-Benz as exclusively a premium brand here in America, its (well, via their parent company, Diamler-Benz) also a huge manufacturer of commercial vehicles, and that includes the very successful Sprinter vans used all over the world. Mercedes has a factory to produce these vans in Charleston, SC, which would make it seem like its building vans right here in America, right? Well, according to a truth in advertising group, not really. That truth in advertising group goes by the cryptic name Truth in Advertising, Inc. and its recently called out Mercedes-Benz for claims that its building Sprinter vans in America. Mercedes has had the Charleston plant for a few years now, and was initially using it to re-assemble Sprinter vans that had been built in Germany and then disassembled, all in a complicated and faintly ridiculous but effective scheme to get around America’s 25 percent “Chicken Tax” on foreign cargo vehicles. While the plant was assembling vans, the workers weren’t really building them, since they were just re-joining the bodies to the chassis (which had to come to the U.S. on separate boats) and the only locally-sourced part was the battery. Last year, though, Mercedes pumped $500 million into the factory, and it seemed like more manufacturing would be done at the plant, beyond just re-assembling German vans after shipping. Mercedes played this up, marketing the vans as “Built in the USA” in their advertising. 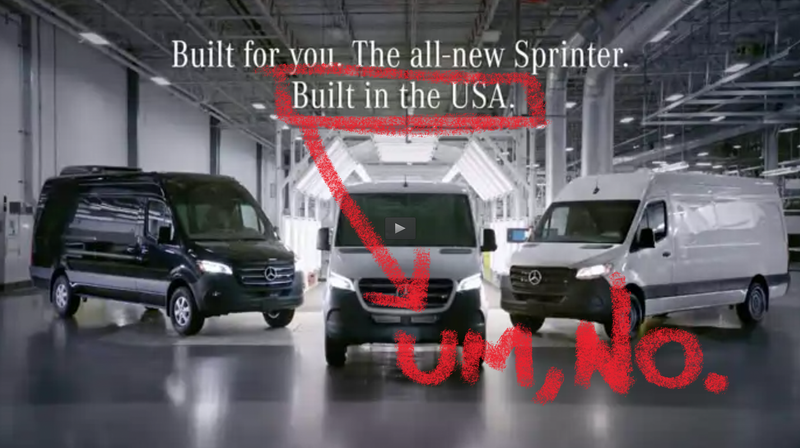 “Specifically, MB Vans is claiming – on national television, its website, social media platforms, Internet ads, radio commercials, and to the press – that its 2019 Sprinter is Built in the USA despite the fact that 90% of a 2,390 sampling of 2019 Sprinter vans offered for sale online by U.S. Mercedes-Benz dealerships are imported from Germany, according to origin information obtained from each vehicle’s unique Vehicle Identification Number (VIN). It also said that “We appreciate TINA’s efforts to alert MBUSA of its concerns,” a statement that I sort of doubt. I’ve reached out to Mercedes-Benz to find out exactly how much of the Sprinter vans are actually built in the Charleston plant, or if it’s just still re-assembling German vans as before. I’ll update when I get a response.